Does the thought of having to make a speech or give a presentation make you feel sick? Lump in your throat? Voice quaking? Knees knocking? I've been a professional presenter and public speaker for more than 12 years. But it wasn’t always like that. Speaking didn’t come naturally for me. Possibly like you, I often watched other speakers, and wished I had their ability. What if nerves got the better of me? What if everyone could see my knees and hands shaking? What if I forgot was I going to say? Although I had great personal determination to succeed, I consider myself very lucky to have been mentored by some of the big names in show business. I was the personal manager of a very famous British celebrity by the name of Paul Daniels, he’s like the Johnny Carson of England. He taught me all of his insider tips, secrets, and methods’for becoming a captivating public speaker. In turn, Paul had learned by working alongside people like Judy Garland, Frank Sinatra, and Sammy Davis Jr, - yes, world renowned celebrities! Paul’s prime-time national BBC TV show ran for more than 14 years and it topped the ratings not only in England, but across the world in 43 other countries such as Canada, New Zealand, Germany, Spain and Japan. As a presenter, he hosted some of the most popular game shows on British TV, including ‘Odd One Out’, ‘Every Second Counts’ and the highly rated ‘Wipe Out’. He starred in his own West End Theatre Show for several years running, headlined in Las Vegas and Broadway, and performed more unique magic on TV than any other magician in history. Occasionally Paul will speak for special audiences such as a small group of Royalty (including Princes William and Harry, the Sultan of Brunei and Prince Rainier of Monaco) or arenas and stadiums of many thousands. He speaks to multi-million and billion dollar companies. All of this did not happen by chance of course. Paul devoted much time and energy to working his way to the top of the business. I tell you all this not to boast, but to reassure you that you are in the best hands. I was mentored by the best of the best, someone who knew how to captivate audiences worldwide. These days my schedule is far less hectic than it used to be, and I want to help you - if you'll let me. How would you like to get access to the very same secret techniques that I discovered, to create and present captivating speeches for any audience? Now you can speak WITH success and WITHOUT fear. Talk in front of any audience without fear. Fear paralyzes and prevents you from doing your best, and we'll show you how to easily conquer it. Receive praise, admiration and compliments about your great speaking. Wow the crowd with your motivating speeches. Hear the audience laugh and have fun. See their smiles. Watch people enjoy themselves and hang on your every word. Captivate the crowd so that they simply don't want your presentation to end. Create a great talk in less time than it takes to watch a couple of reality TV shows. Be a source of inspiration and help others transform their lives. Gain a new found confidence in yourself that permeates everything you do. Achieve all of this by following a simple, easy process. 1. Content. Your message must be packed with practical information, presented in a memorable and entertaining way. 2. Confidence. You must believe that your speech can make a difference. 3. Connection. You must be able to make a connection with the audience so that they respect you, admire you, and are willing to learn from you. The course will show you how to combine these three elements for maximum impact. "The course is first class. I have looked at many other speaking courses over the years, but yours excels in every way. It's easy to read, plus there is more practical advice, more real world tips and techniques, and everything is explained so clearly. I highly recommend the course to anyone who wants to improve their public speaking ability." A step-by-step system to guide you every step of the way, from your first words through to your concluding comments. How to convey your message most effectively. You'll discover the secrets the pros use to energize and motivate your audience. Where to find the content for your talk. Regardless of your subject, we'll uncover an array of hidden resources to provide you with a treasure trove of content. Special techniques to win any audience over. They are simple, psychological secrets. You won't believe how easy it is! The uncovered truth about what makes a great speaker - you can't afford to be without this information because you can duplicate the same techniques and get the same results. You'll Soon be Saying YES to Every Speaking Assignment! Order this system today and you can accept speaking engagements immediately. The reason most people turn down an opportunity to speak is fear. They're afraid of not knowing what to say, or how to say it. That can all change now! 1. Is it really possible to speak without being stressed out and nervous? 2. Where do I find information on my subject? 3. How do I know what points to highlight or what points to leave out? 4. How do I organize all this information? 5. Where do I find suitable illustrations, examples, stories, statistics, anecdotes and other supporting resources that will enhance my presentation? 6. Should I use notes, memorize my talk, or what? You'll get all these questions answered and a lot more. How many points should you try to make? Get the definitive answer. 7 premium places for research. All of them FREE. How to determine which points are the BEST of all the research you do so you don't waste your time. A simple system for eliminating weak material. How to choose the right presentation format for the group you are speaking to. 6 ways to liven up the dullest subjects. Smooth transitions to help you move between thoughts. THE SECRET of effective, fearless speaking. Everyone keeps telling me that this one secret is easily worth the price of the entire course on its own! False starts...or...how NOT to start your talk. 12 fantastic ways to open your message. They'll work consistently for you. 6 solid options for closing your message, so the audience will not only remember you, but will invite you back. This Simple Step by Step SYSTEM will give you every tool you need to craft and deliver audience-magnetizing messages. It doesn't matter if you have never spoken in front of a group, or if you are on the professional circuit. 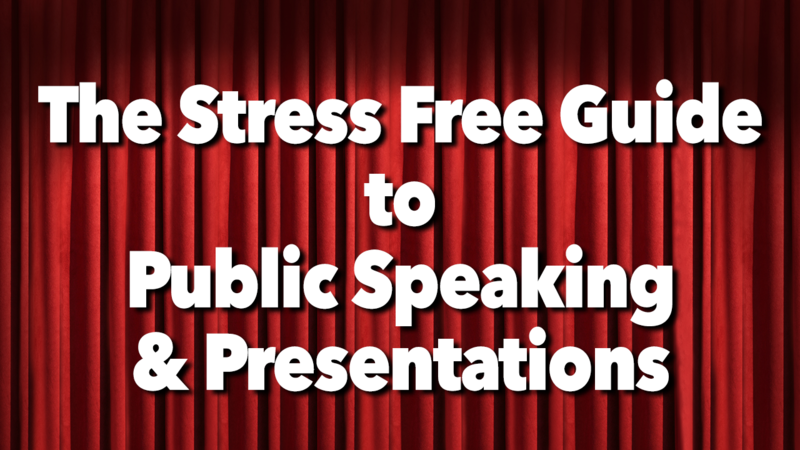 The Stress Free Guide to Public Speaking and Presentations is your shortcut to great speaking. There's no padding or waffle on any of it's more than 115 pages. Literally, you get step by step instructions for creating speeches, talks, messages, and presentations, from scratch, with no previous experience. ONE: It is written by a true professional speaker. Many courses and books out there are by individuals who write about speaking but have never actually done it themselves. Learn from someone who walks the talk. TWO: Shows you step by step how to develop, refine and deliver your message in your own style. Many books force you to learn techniques that don't suit your personal style. THREE: Explains the reasons why you need to do certain things. It's one thing to be told what to do, but if you are helped to see why, you will be far better equipped for long-term success. When you're introduced people will say, "This is the speaker I told you about"
The video included in the course contains a wealth of practical tips and techniques that you can see being demonstrated, in front of your eyes! Relax and enjoy this powerful extra content. If you order right now, you'll also get 6 FREE Bonuses...worth more than $300.00. These bonuses are not guaranteed to be available forever, we may withdraw them at anytime. How many times should I read through my speech before presenting it? What should I do when my mind goes blank halfway through a sentence? What if there are many audience questions but I am already overtime? How can I present to people of other nationalities and cultures? What should I do if there is a power-cut? What if the main decision maker is away at my sales presentation? What should I do with my hands while I am presenting? Should I stay at the podium or move around the stage? What should I be aware of when giving a presentation outside? My mouth dries up very easily - what can I do? The answers get straight to the point. No waffle, just solid, practical advice that you can use immediately. These tips alone will provide more help than 99% of public speaking books out there. Retail Price: $77.00...You get it for FREE! This is a must-read report, with some stunning revelations about what to do and what not to do with PowerPoint. Endorsed by numerous professors, this guide will shatter what you already know and cause you to revamp every PowerPoint Presentation you make from now on. Specific instruction on what fonts and sizes to use for the best psychological, emotional and practical impact on your audience. Why and how the use of blank slides (yes you read that correctly) are vital to the success of your presentation. How you can guarantee that your presentation will work on the day, regardless of any other external factors. What colors and backgrounds to avoid like the plague, and which ones will enhance your presentation. Don't waste time searching through reviews, trudging down to the stores for demonstrations, or trying to seek the advice of spotty sales assistants who know less than you do. This is the definitive guide to choosing a suitable video projector for your presentation. How to save a fortune by buying right, first time, from the right sources. The internet has some great information, but it also has plenty of rubbish. Don't waste hours wading through the clutter of poorly presented and often inaccurate information. This resource is worth it's weight in gold because it directs you straight to the absolute cream of the crop of websites related to public speaking. Which search engines are best for certain types of research. A host of top class, FREE tools to help you gather your content. Hidden Online copies of public speeches from great leaders. Use them for inspiration, for quotations, for research. Professional public speakers regularly access this unique content. This advice alone will be worth your entire investment. Where else can you get professional speaking advice with such an incredible package? Retail Price: $27.95...YOURS FREE! Bonus 5: Collection of Jokes, Quotations, One-liners and Top 10 lists for virtually any occasion. Over the years I have developed an enormous file of jokes, quotations, one-liners, and Top 10 style lists that have always worked for me. What would you pay me to access those for your speech? Well, I finally relented, poured out the contents of the filing cabinets and assembled all these priceless gems into one document. It's not pretty (the formatting could use some work) but it's all there, and it's the exact same content that has enabled me to earn a fortune over the years. The ability to draw on instantly available humor is one aspect of public speaking that you will always need. This specially compiled, resource is not available anywhere else, it is an exclusive bonus with this course. It happens to the best of us at some time or another. You are mid-way through your presentation or talk and something dramatic happens - it could be a loud crashing sound from the back of the room, you drop something important on the floor, there is a power cut, the projector light bulb blows, the sound system squeals and screeches...the list goes on. If you are not prepared, these unplanned things can really throw you. But now you don't need to worry, because along with my personal favorites, we've surveyed the top presenters around the world and compiled a list of the best one-liners to take the heat out of virtually any situation. Can you put a price on something like this? Not really. You WILL need it at some point, and what better time to be prepared than right now. Just read through these lines you'll see how effective they are. You'll be all set to cope with anything that happens. The Crazy Low Investment for "The Stress Free Guide to Public Speaking and Presentations"
This course is different in every way from other speaking trainings you may have encountered. First, you'll benefit from the backing and experience of one of the most successful presenters and entertainers in England, Paul Daniels. Second, it’s comprehensive. It’s a step-by-step guide that contains everything you need to know, including HOW to do it. Last, and most important you’ll also get guaranteed results, more about that in a moment. The retail price that I initially settled on for this exceptional training was $497, but I managed to persuade the publishers to offer it for a much lower price for a limited time, in order to get the word out, receive more testimonials, and launch the course with a fanfare on a much wider scale. So you'll be delighted to hear that as a special introductory offer you get The Stress Free Guide to Public Speaking and Presentations main course, the video training, and ALL THE BONUSES (a package worth $$$ for only $99 if you act right away. That's considerably less than taking a public speaking class at your local community college with a professor so dull you won't learn anything because you can't stay awake. Save your money, time and energy and get this system now! Another way to look at this is a measly $1 a day for a couple of months. That's much less than the average cost of a Starbucks coffee, or a daily newspaper and a couple of snack bars. Surely your self-improvement and the ability to captivate any audience is worth more than that? Frankly, if you are not prepared to spend this amount then you should not read any further, you are probably wasting your time. Perhaps the real question should be, how much is it going to cost you NOT to have this information? Can you put a price on conquering your fears, being held in high esteem, feeling great about yourself and all the other many benefits that space doesn't allow me to list again? As I said, I want to preview the course to a small number of people before rolling it out. That way, we can tweak it here and there from your feedback, and perhaps include some more questions and answers. I remember what it was like to lay awake at night wondering what I was going to say. I remember my palms sweating so much it was embarrassed to shake hands. Those early days were rough. If I can save someone from going through that agony, it's more than worth it to give a huge discount. Also, I want to help as many people as possible. At $99 that can be accomplished. People who are serious about their speaking surely have $99 to invest in themselves, don't they? Your satisfaction is assured through my no risk, no quibble, 100% money-back guarantee. If for any reason, you aren't thrilled and satisfied with your purchase, just contact me within 30 days of placing your order and I'll refund 100% of your purchase price. What I'm saying is don't decide now if "The Stress Free Guide to Public Speaking and Presentations" is right for you. Try it out, risk-free. You really don't have anything to lose. If, within 30 days it doesn’t help you overcome any stumbling blocks in public speaking, if it doesn’t guide you step by step from beginning to end of the message process, if it doesn’t show you how to impact your audience, if it doesn’t take you by the hand and teach you exactly how to get your words out more effectively, if it doesn’t make creating your own speeches easier than you ever dreamed possible, then I don’t want your money…I’ll give it all back. Once your payment is processed, you’ll get instant access. Don't wait. You are moments away from dramatically changing your speaking ability. Take that first step by ordering the system, and let me do the rest. Scroll up the page and click the orange 'Purchase course' button on the RIGHT hand side of the page. P.S. - Will you think about it, or will you try the course right now? If you think about it, how much better off will you be? On the other hand if you try it out now, you have nothing to lose and potentially you'll overcome your fear of public speaking, plus reap many other benefits besides that will affect your income, your relationships, your career and your personal life in a very positive way. The introductory offer is limited... so act fast!...Order NOW! P.P.S. - This course may be tax deductible as a business expense, because it is a training manual, so don't delay in placing your order. Consult with your financial advisor or tax consultant first to verify local laws. Remember too, I may increase the price at any time since this website is a marketing test. Act right now! How to Get a Standing Ovation - Every Time You Speak! Learn the secrets to planning and delivering a world-class presentation. all the skills to being a popular and in-demand speaker! Yes! Im Ready to Take This Course!